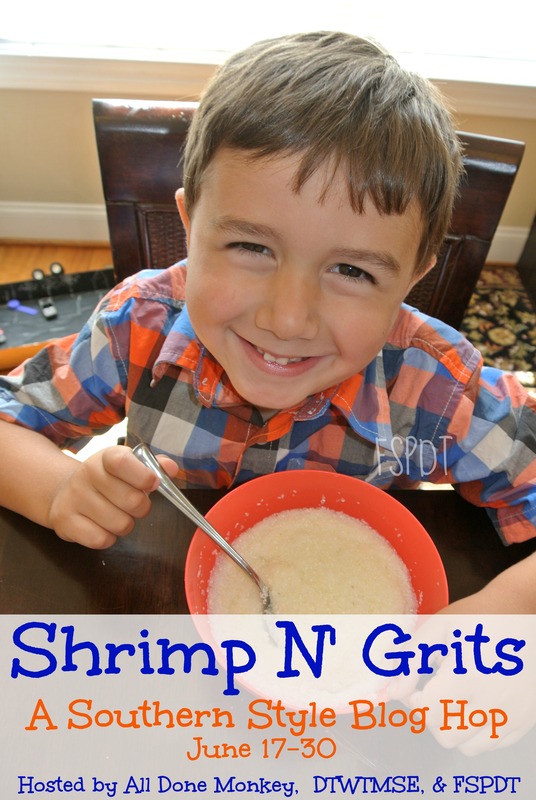 This post is part of the Shrimp n’ Grits Southern Style Blog Hop. You can find more information and more Southern themed blog posts at the end of this entry. Elvis was known for loving some down home Southern food. He was also known for loving peanut butter and banana sandwiches. As an icon of the South, he knew good food when he saw it! Some years back, in celebration of his birthday, Reese’s put out a peanut butter cup that had peanut butter and banana. My husband could not get enough! But, since it was a limited edition kind of thing, they are not readily available. Line 9-inch square pan with foil, with ends of foil extending over sides. Bring sugar, butter and evaporated milk to full rolling boil in 3-qt. saucepan on medium heat, stirring constantly. Cook until candy thermometer reaches 234°F, stirring constantly. Remove from heat. Add peanut butter chips and marshmallow creme; stir until melted. Stir in vanilla. Make sure the mixture is well incorporated. Pour into prepared pan; spread to cover bottom of pan. Cool completely. To prepare the frosting, beat together cream cheese and butter until smooth. Gradually add powdered sugar (in 1/3 c. measures), beating until incorporated and smooth. Add banana extract and stir well. Divide into two bowls of equal measure. After the fudge is completely cooled, pour only one portion of the frosting over the top of the fudge and spread with an offset spatula. Chill in the refrigerator (overnight). Cut into squares. Keep refrigerated. Welcome to the Shrimp N’ Grits: A Southern Style Blog Hop! From June 17 – 30, bloggers are invited to link up their family-friendly posts about life in the South: recipes, crafts, kids’ activities, and more! So grab a big bowl of shrimp n’ grits, a tall glass of iced tea, and sit back on your porch swing, because we are getting ready for some down home fun! Oh my goodness, I’m not even sure I should make this because I think I would EAT THE ENTIRE PAN MYSELF! This looks so good! My grandfather always made incredible fudge for us, but I don’t remember him ever making anything like this. It is an inspired creation! Thank you so much for co-hosting the Shrimp N’ Grits Blog Hop! Thanks, Leanna! My husband is working his way through it pretty quickly. It is dangerous because it doesn’t really get shared. Not very Southern hospitable – I know! Thanks, Grace! So glad you stopped by and ogled my goodies (wait, that doesn’t sound right). Oh goodness this looks incredible! If only this was on my diet! Hi Stephanie! They are yum and worth breaking the diet for one little piece! Thanks for stopping by and leaving a comment! Ohmahgoodness… this is getting pinned as soon as I leave this comment. I cannot wait to try this and am SO grateful you linked up with us for the LOBS party!! Thanks so much, Kristen! It truly is pretty tasty. My husband and I are plotting our next fudge creation right now! Oh yeah! You’re right 🙂 This really does look amazing! What a yummy recipe!!! I must try it :). Elvis did have some good taste – Can’t beat a peanut butter sandwich! Yummy!! Thanks for sharing with us @ My Favorite Posts SHOW OFF Weekend Blog Party!